Last week was crazy busy. I was feeling a little stressed out so I distracted myself with a small project Friday night. Starting (and finishing) this cute little pincushion was just what I needed. 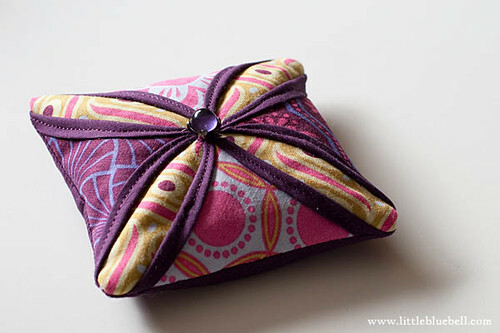 Kim of My Go-Go Life wrote a great tutorial on how to make a cathedral window pincushion. I've never sewn this block before and this was a fun way to try it on a small scale. I have a crush on Kim's version. She used Good Folks by Anna Maria Horner and it's gorgeous! I stuffed mine with crushed walnut shells, aka, lizard litter. It helps keep your needles sharp and adds a nice weight to your pincushion. If you have never used lizard litter before, you can read some of my tips here, "Another Use For Lizard Litter". This is going to the home of my Pillow Talk Swap partner. I used a combination of prints from Heirloom by Joel Dewberry and Pure Elements in Cabernet. The button was from my button jar and I thought it was just perfect. So so pretty! I made 3 of these last week, they are kind of addictive! How cute - it's just perfect! Oh I've been meaning to make one like this! So cute! this is on my list=i love how yours turned out-and thanks for the lizard litter tip! Gorgeous! I love each one of these I've seen, using that tutorial. Adrianne, I love yours! I am addicted to the Joel Dewberry Heirloom at the moment :o) I want to try the walnut shells, sounds interesting. I really want to make one of these. :D Yours came out so well! And will look great with that pillow! How lovely! I saw that tutorial and thought it would be a great way to try out cathedral windows. Thanks for the tip about lizard litter!